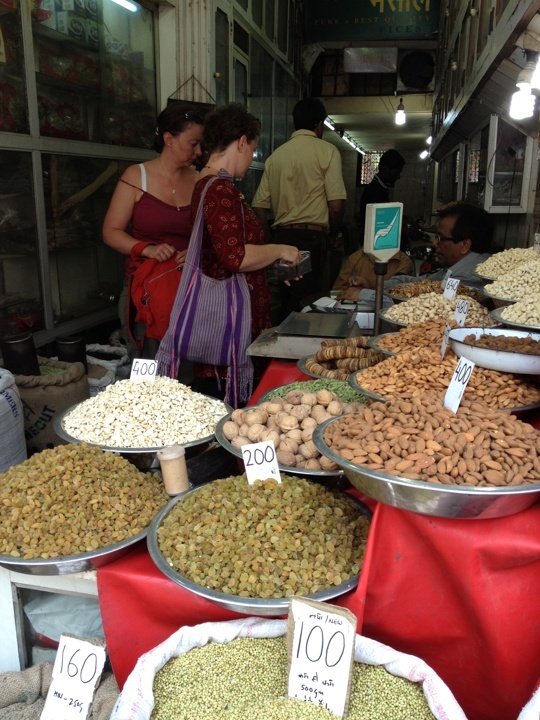 and Janpath – FabIndia for pretty tops – on Tuesday we headed to Old Delhi’s Chandni Chowk to visit the wholesale spice market on Khari Baoli we’d been told about. The remains of the gracious mughal city of Shahjahanabad can just about be traced behind the chaos of Delhi’s wholesale markets selling everything from paper to car parts, but the graceful courtyards and terraces have been filled with packed-in dwellings and shops housing the traders, rickshaw drivers and sweepers who live here, New Delhi’s down-at-heel neighbour, these days. 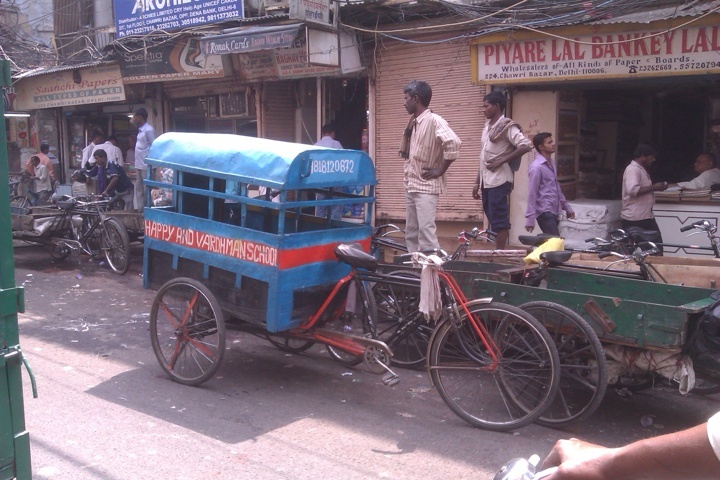 ‘Rocky’, ‘Rickshaw Pilot’ (his description!) trying to squeeze us between two buses. 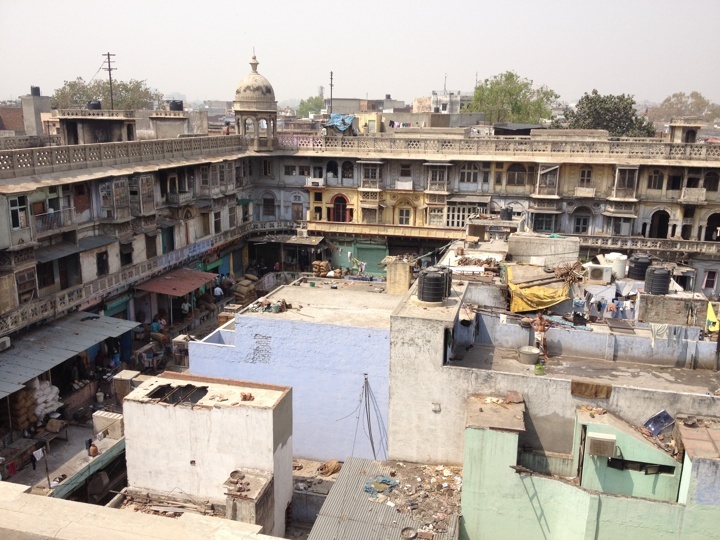 As luck would have it, ‘Rocky’ actually lived in one of the tiny one-room apartments in the chawls that have sprung up inside the spice market so knew his way around. 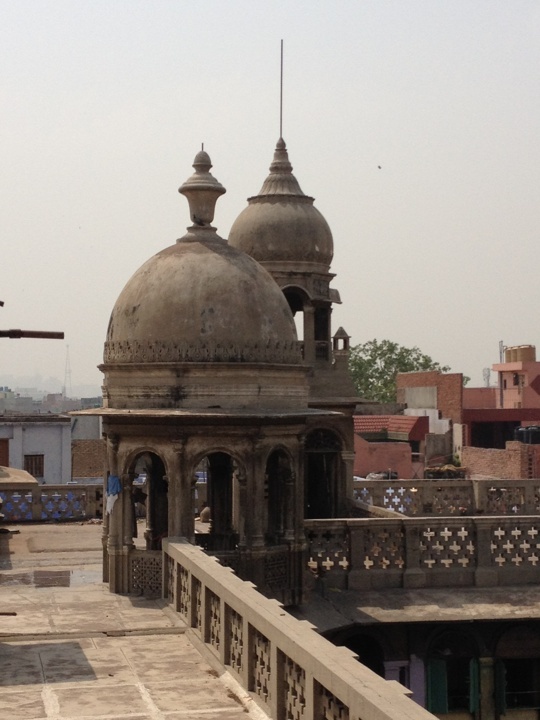 He took us up onto the roof (via some terrifyingly precarious stairs) from where we could see down into the building itself on one side and the courtyard of the mosque on the other side. 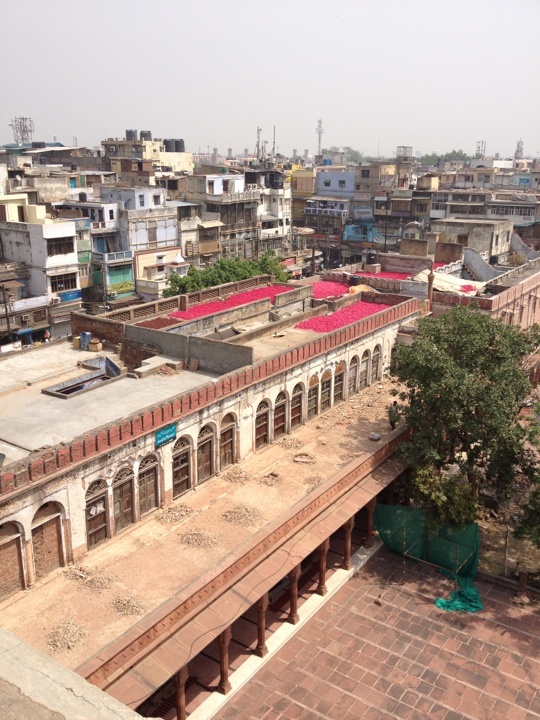 Top of the spice market – you can see the classic mughal-style building around the courtyard, and the warren of buildings cobbled together inside it. 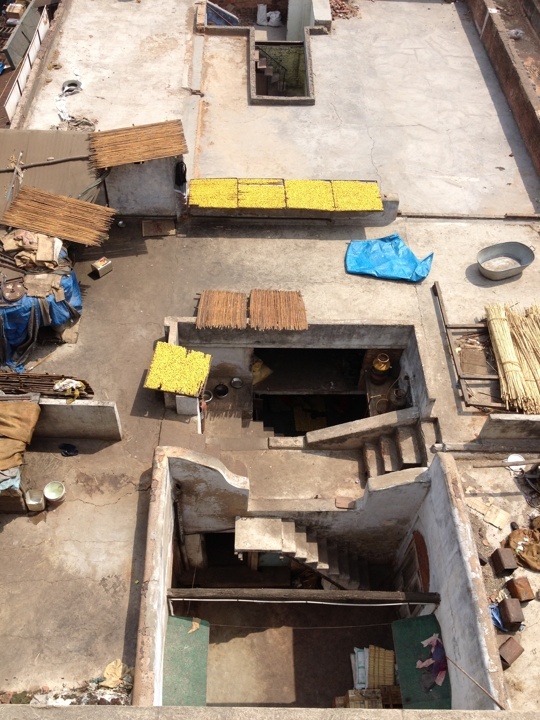 The old courtyards have been built up and filled in to house the hundreds of people who live and work in the building complex. Inside the spice market building the air is filled with the aromas and powders of the herbs and spices, so your eyes water and throat itches. I can’t imagine what living there is like, although maybe you become immune to it. 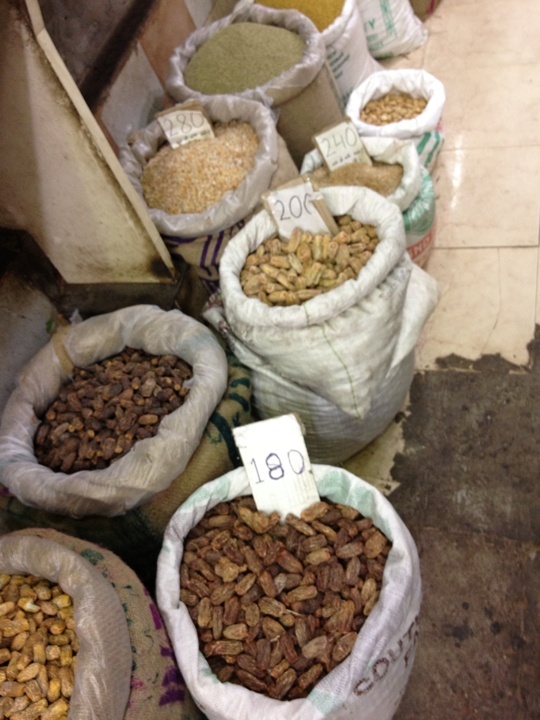 The market was wholesale only, so Rocky brought us to a shop (where presumably he got a cut!) 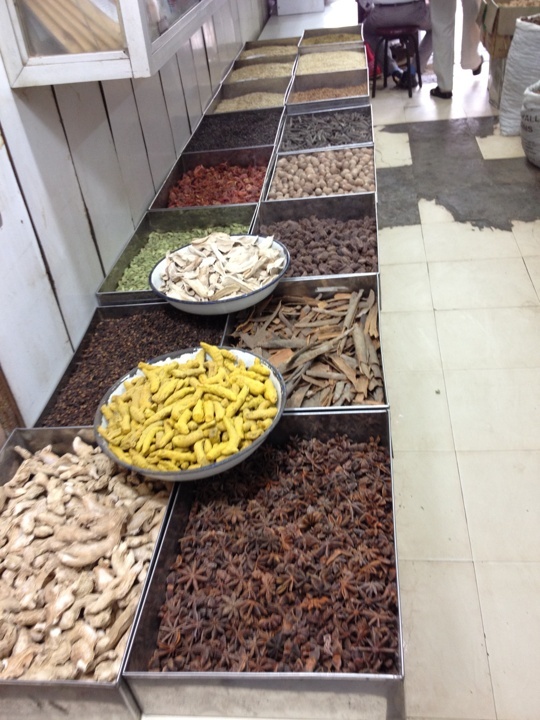 where Tamsin and I stocked up on everything from vanilla pods to turmeric root. 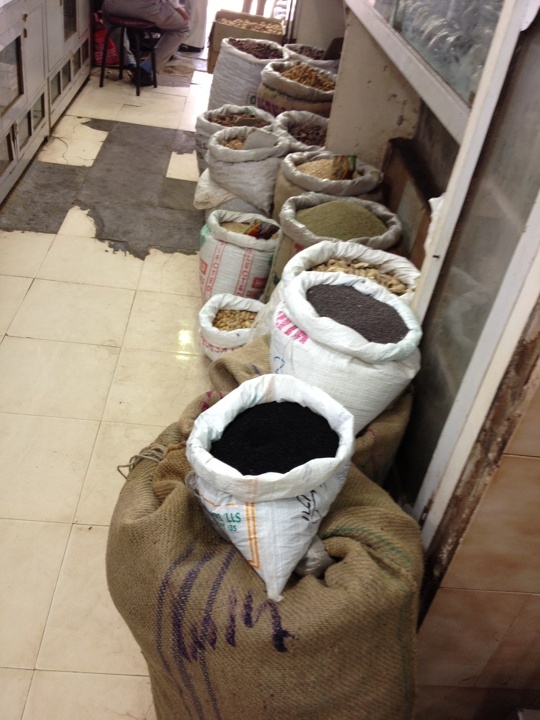 Shopping done, we headed back to Paharganj for lunch and to drop off some more tailoring (I’ve said it before, but I love how you can get ANYTHING fixed in India!) and to package up various things to be posted home. Quite exhausted from the heat and hecticness, the only answer was a night in watching TV and drinking the remains of our gin! The next morning Tamsin and I were up early to visit Kairali, an Ayurvedic spa we’d been recommended by a woman we’d met in McLeod Ganj. 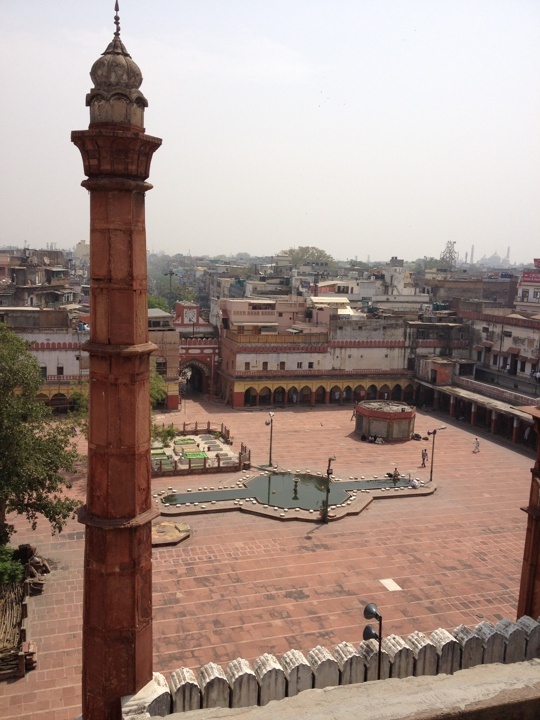 We took the fabulous Metro out to Qutb Minar stop in Mehrauli – although this did involve having to shout at the security people to let us over the footbridge to reach the New Delhi metro station. Bizarre system – the only other way to reach it from the main thoroughfare Chelmsford Road is to go through the main station, which entails queueing with all the potential passengers to be security scanned and having ticket to travel. Classic bureaucracy-gone-nuts. 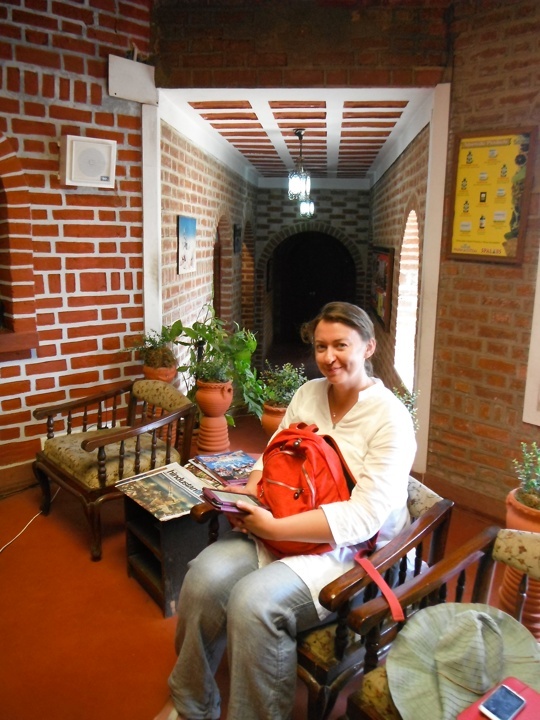 Tamsin in the reception of Kairali, just before we both had Elakizhi treatments. After the treatment – quite unlike anything either of us had had before, with two therapists really going for it with the firm massage and battering with herb-filled muslin bags – we both felt shiny and invigorated, and ready for lunch. We met Randall at Basil & Thyme, a restaurant recommended to us by Christopher, who was sadly unable to join us. It was a lovely restaurant – all smoked salmon carpaccio and light Mediterranean main courses – a bit River Cafe, although sadly no wine as it’s not licensed. The glamorous maitress d’ even told us where the recipe for the delightful strawberry and cinnamon torte came from. Randall headed off while Tamsin and I nipped to the salon next door for a leg-and-other-bits wax. 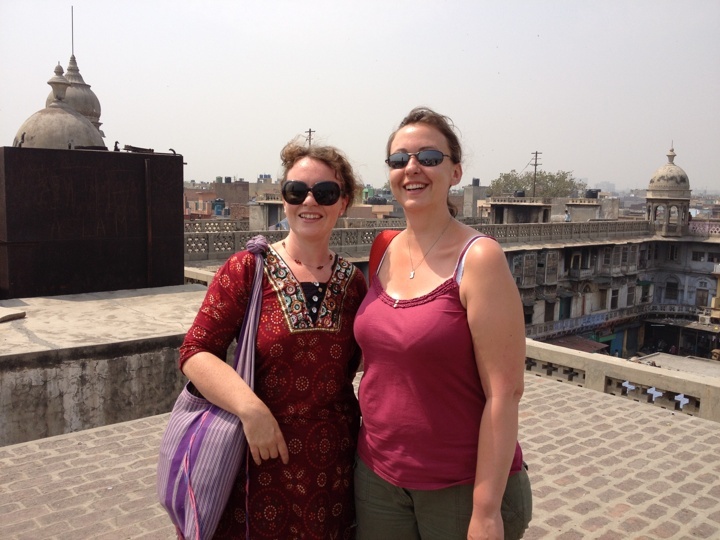 This turned out to be an interesting experience as, before either of us realised what was happening, we had got rather more (or, indeed, less) than we had bargained for. 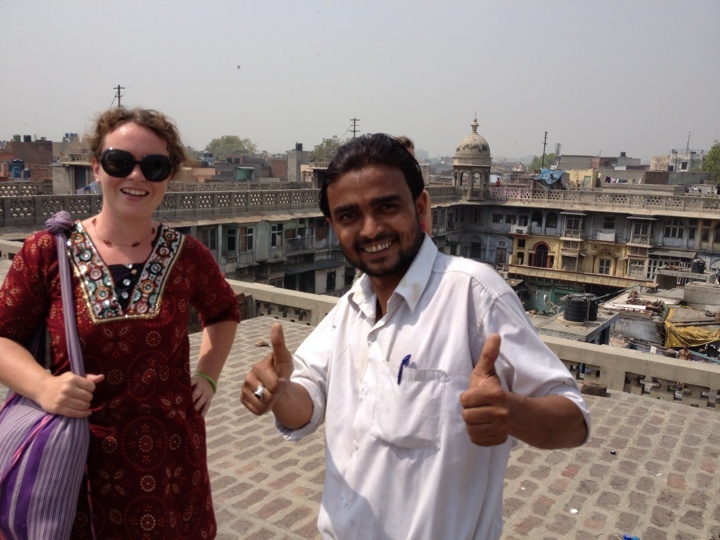 Some cultural differences really are quite unexpected and enlightening! To round off Tamsin’s trip we went to meet Daleep and the elusive DJ (both friends from when Charlie and I were first in India) at Aqua, the poolside bar at The Park Hotel. Nice bar, good music, good mezze menu, but the most uncomfortable selection of furniture! A good night of catching up on the past and planning for the future, topped off by Daleep having to leave because his twin sister had just gone into labour! 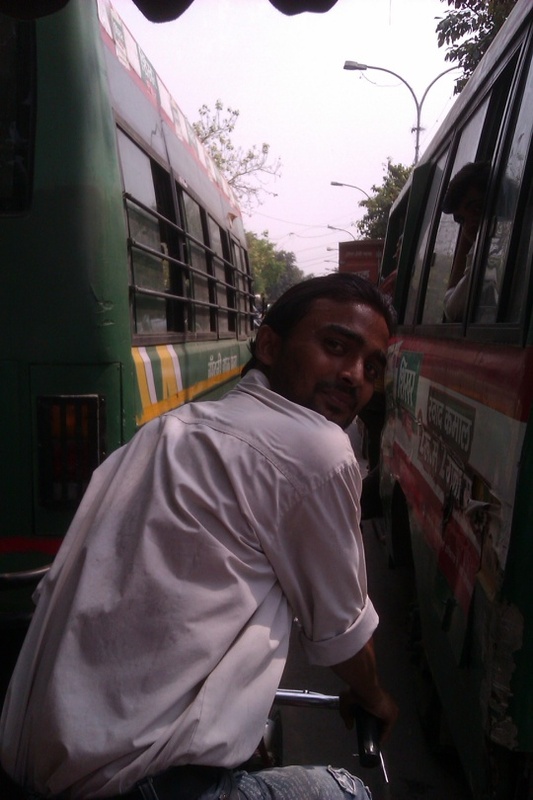 DJ drove us back to Paharganj, very nobly not turning his nose up (much! ), for a few hours sleep before an early start for the airport. 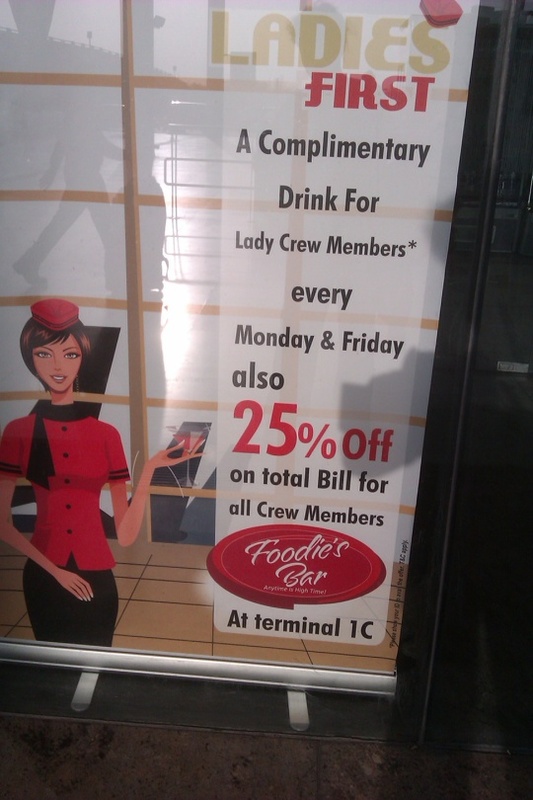 Casual (or indeed overt) sexism of any kind not dead here yet! Hooray- DJ is alive ! !